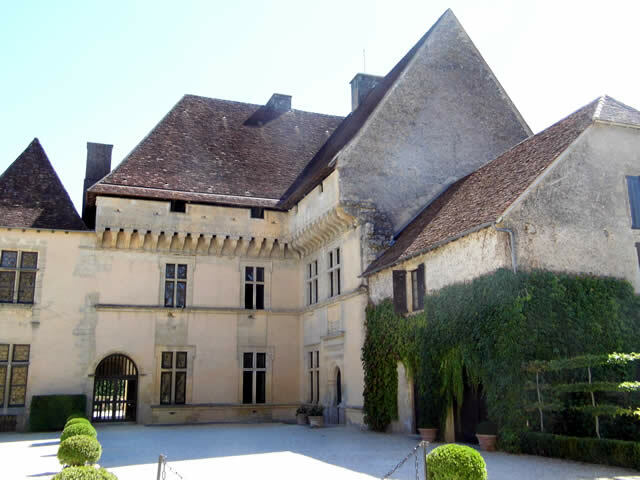 Near to La Rogue Saint-Christophe on the D70, 5km from Montignac-Lascaux, towards Les Eyzies is the Chateau et Jardins de Losse. It is well worth a visit for the gardens alone, they are gorgeous. 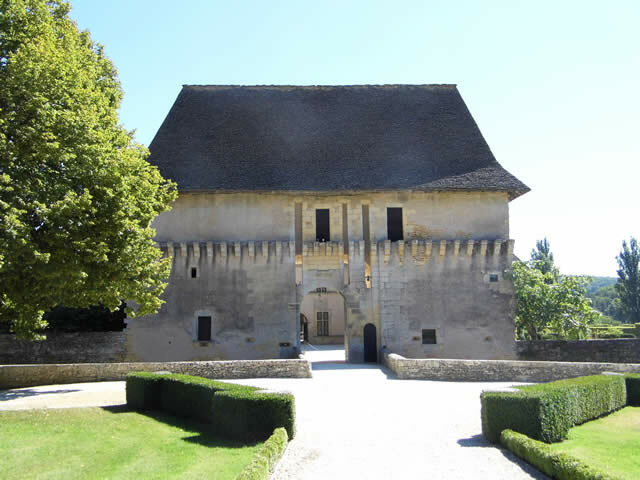 Be forewarned you cannot take photographs of the inside of the Chateau which is a great shame, for they have a very good selection of 16th and 17th Century tapestries, paintings, furniture, weapons and a very interesting chest in the basement with an ingenious lock system. 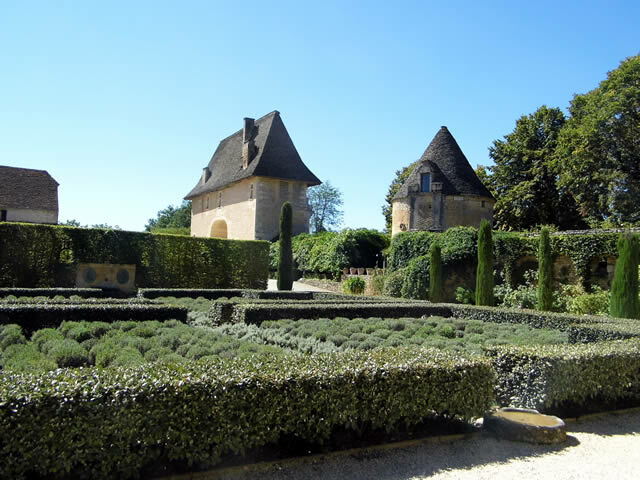 I will not tell you here how to open the chest because that would spoil it for you if you want to visit the Chateau when you are next in the Perigord Noir. 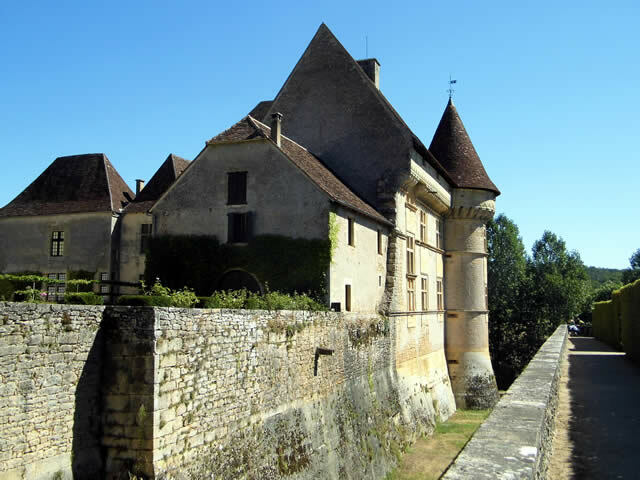 The Chateau is protected by a deep moat and curtain wall, which opens onto a grand terrace which overlooks the river Vezere. The decoration of the fascade are all carved in limestone. 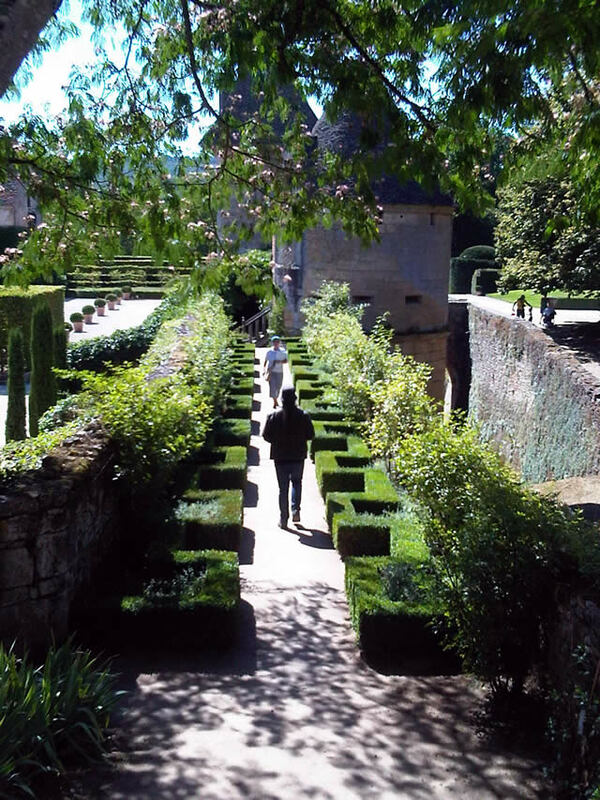 This is Adam and I walking around the gardens which are all in the Renaissance style and have been labelled ‘jardins remarquable’ (remarkable gardens) by the Ministry of Culture in 2004. The heady scent of rosemary, lavender, and roses fill the air. 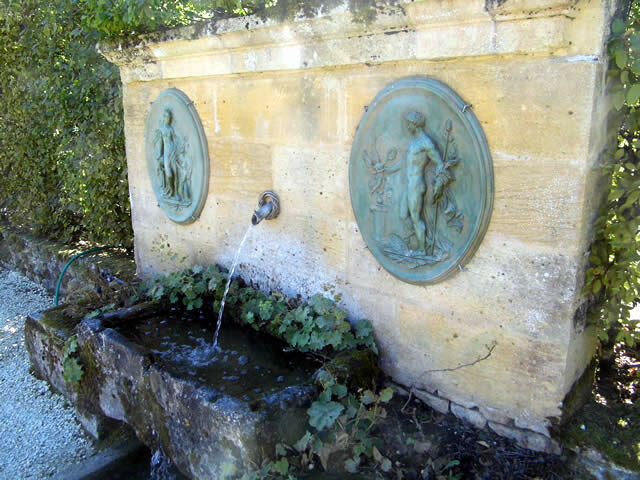 This is a fountain decorated with two figures of Apollo and Venus, the water flows among the topiaries by way of a small channel. Please watch your step, the open channel crosses the path. 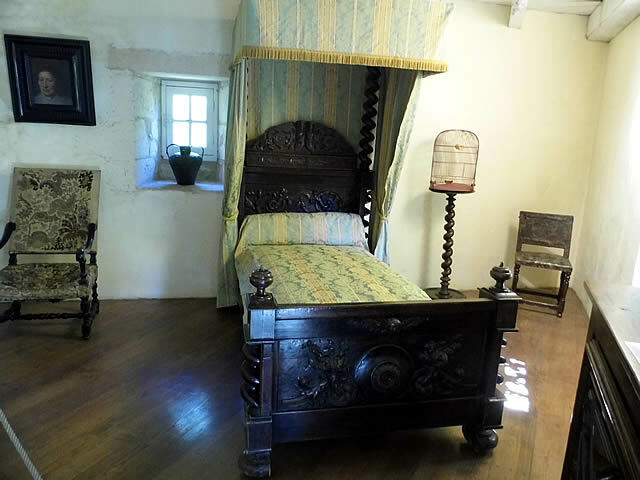 This is inside one of the towers in the garden, a surprise bedroom with an interesting bed which was carved in the 16th Century. Next door is a bathroom. There is also a knot garden, which over looks the river and a rose lined walk. 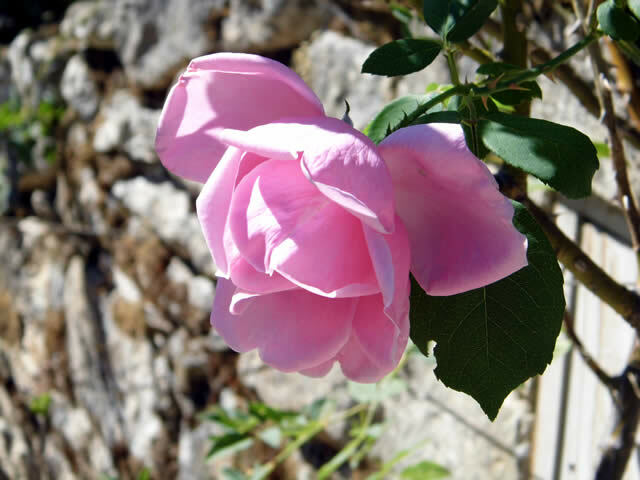 This is one of the roses, the perfume was gorgeous. 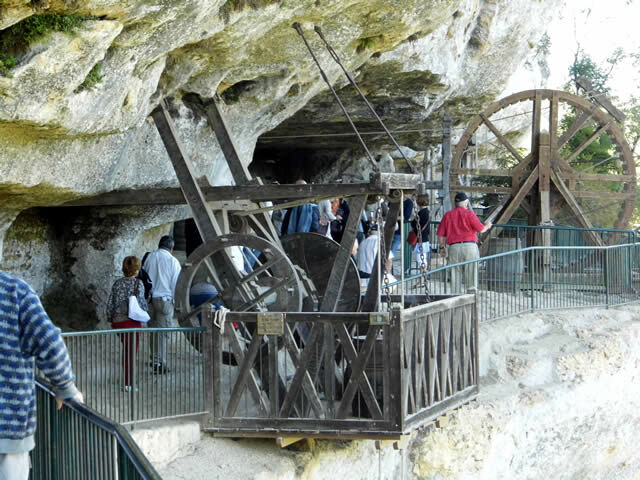 The well winch (foreground) was used to lift and lower two loads at the same time. When one load went up the other went down. 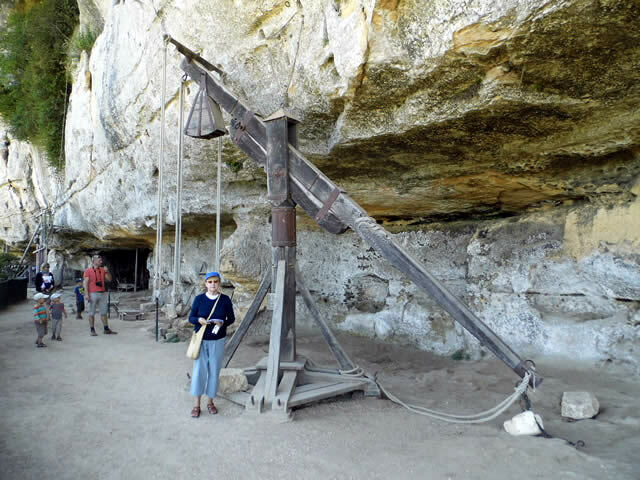 The single barrel winch was used for lifting heavy loads. It is easy to imagine one large man or two small men to walk inside the wheel in order to lift about seven times his/or their body weight. 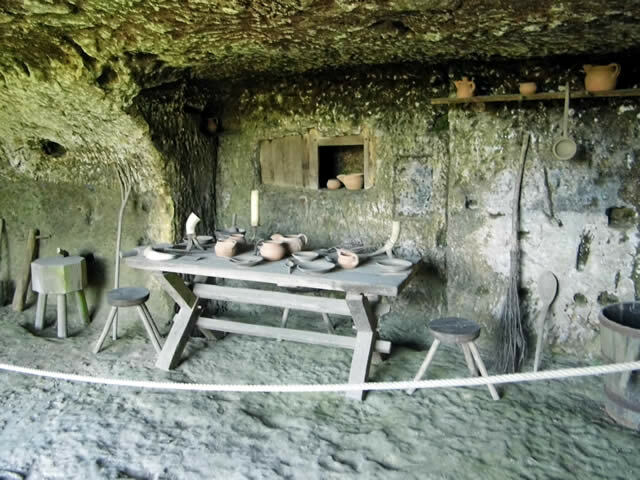 Inside one of the reconstructed medieval homes. 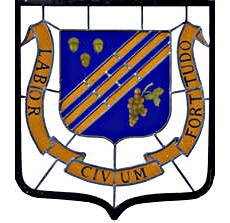 The fortress kitchen. 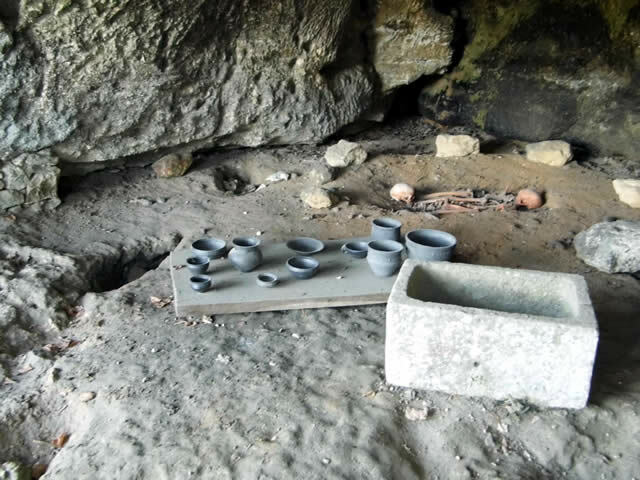 All of the displays are exact replicas of archaeological objects found on the site. 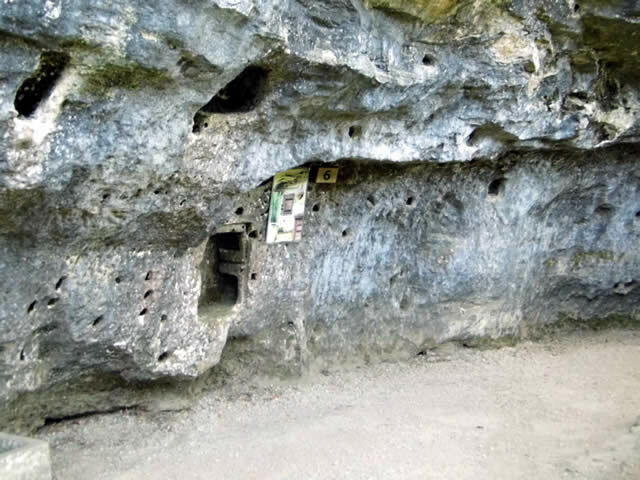 As for the drainage system, a sink and a gutter were cut out of the rock close to the exit. 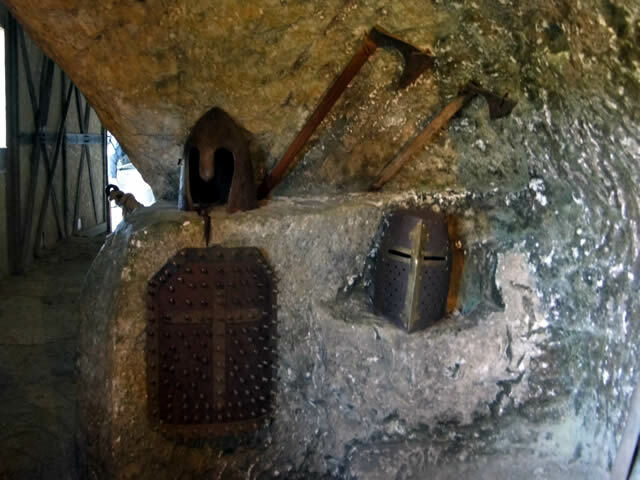 Cupboards and rings, all cut out of the rock, are visible, as well as simple holes carved to accommodate shelves. 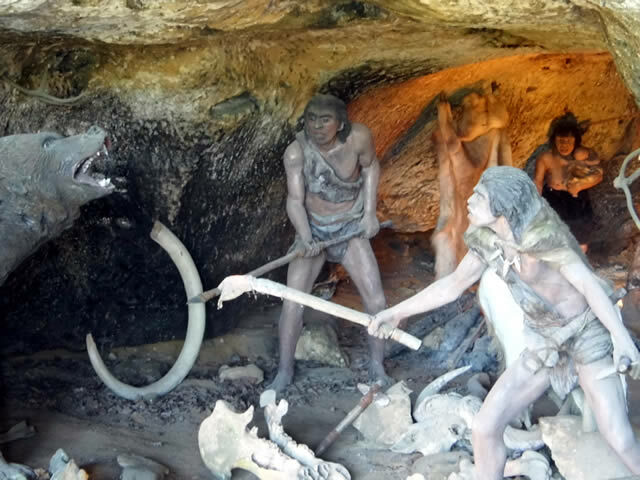 The first inhabitants of the site were probably Neanderthal man who occupied the site 55000 years ago. Many skeletons were found on this site. 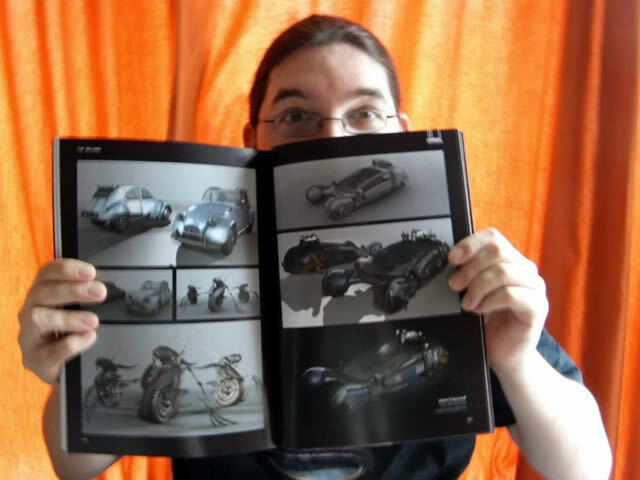 Awesome news, a selection of our son Adams work has been published in ‘The Unreal Game Engine: A Comprehensive Guide to Creating Playable Levels’, on pages 210, 211 in the gallery section. 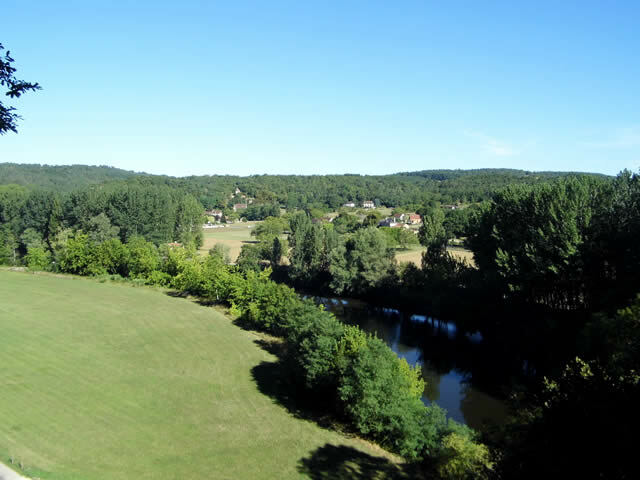 The Vézère Valley is often referred to as the Valley of Mankind because it has such a wealth of prehistoric sites, fifteen of which have been listed as UNESCO World Heritage Sites. 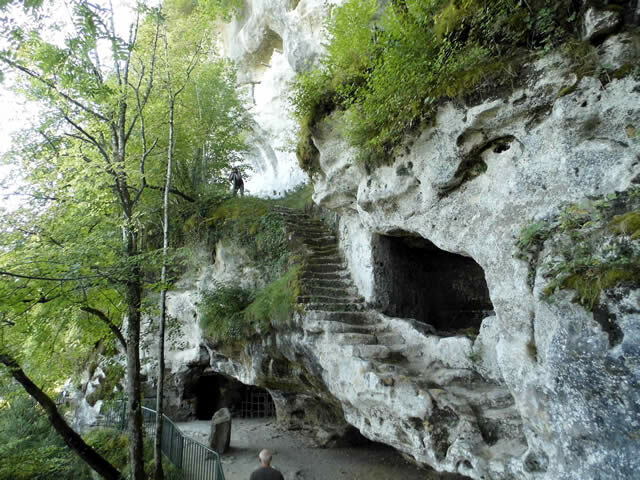 It is thought that people were living in this area as far back as 400,000 years ago; today you can still see evidence of their lives, particularly in the area around Les Eyzies. 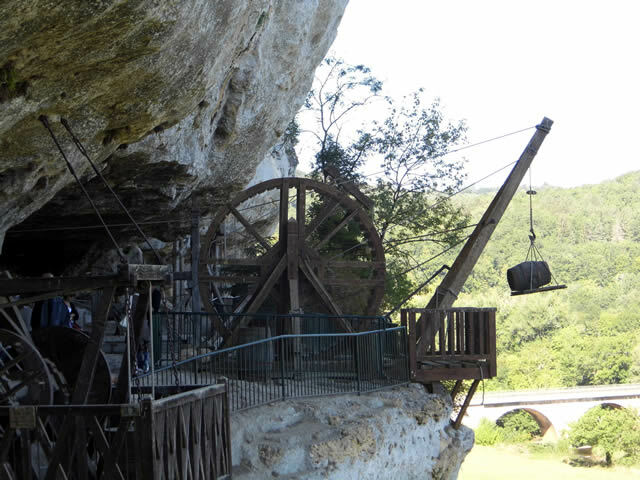 La Rogue Saint-Christophe at Payzac-le-Moustier is one kilometre long and eighty meters high. 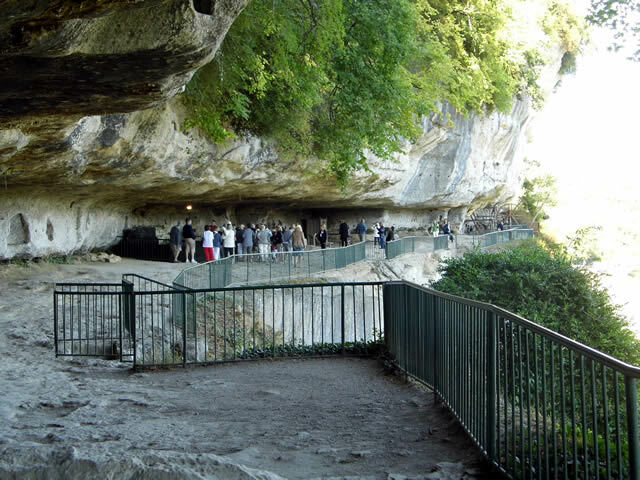 Its limestone walls have been eroded by the rain and frost to shape hundreds of rock shelters and long overhanging terraces. 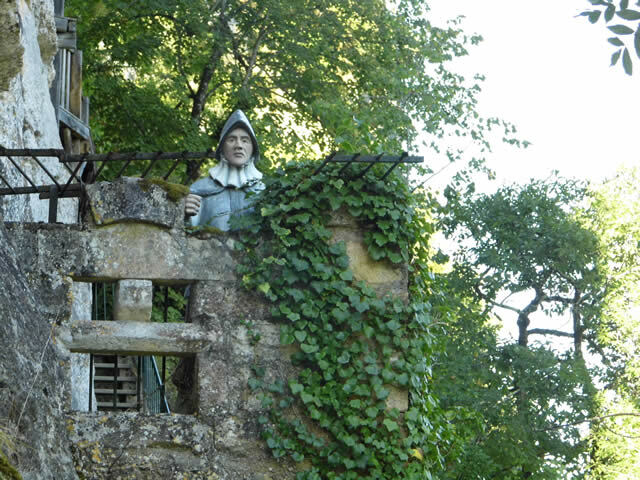 The natural cavities have been occupied since prehistory and were altered to become a fort and a medieval town until the start of the Renaissance period. It was so impregnable that during the Hundred Years War the English managed to take it only by starving out the inhabitants. 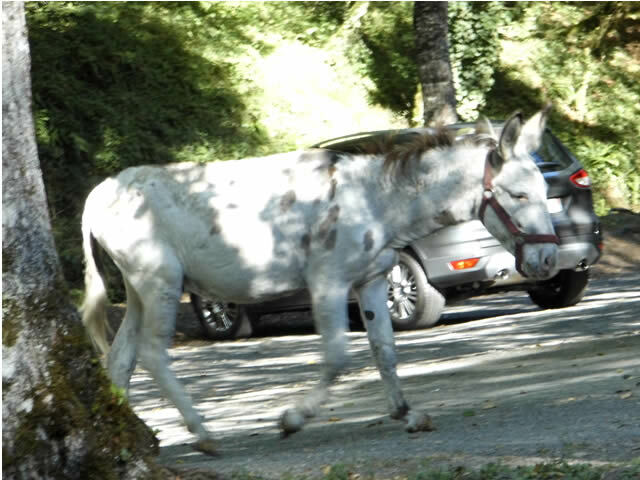 This photograph was taken before we entered the Fortress, at the small café, a rather unusual visiter popped in to beg treats. This was the only entrance to the fortress. 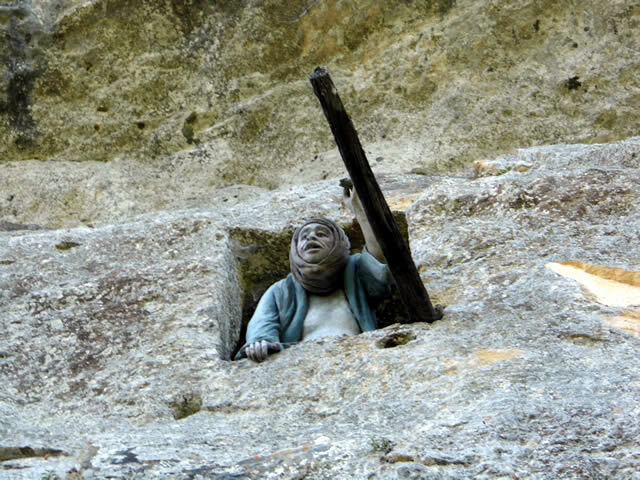 The defence system of this entrance includes a narrow passageway which is just below the look-out post, from which stones could be thrown onto the heads of any assailants. A reinforced drawbridge was added in the Middle Ages. From this second lookout post you can see a cave at the far side of the cliff. Also from this position a watchman could see or hear someone stationed in a similar lookout post further downstream, the second watchman could then communicate with a third and so on for 11.16 miles (almost 18 kilometres). The safe, dating from around the 12th century-you can clearly see the marks from the shelves. This shelter is over 300 yards long. It is the biggest natural shelter in Europe. Around thirty houses would have stood here, on this enormous terrace. Down below you can see two other floors and communicating staircases. 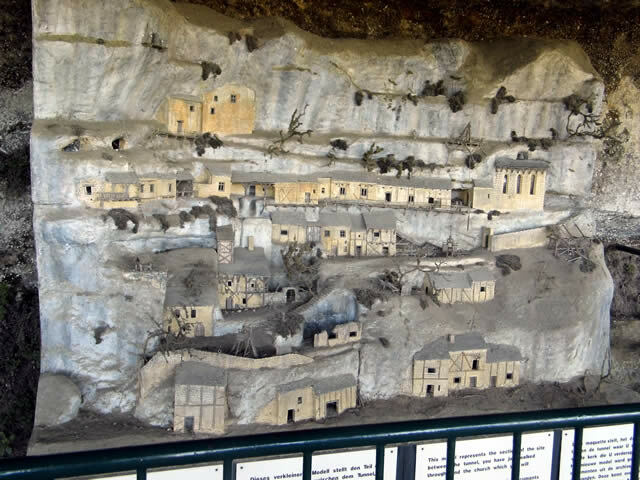 In total there would have been hundreds of houses simply built into the hollows of the cliff face, others built directly onto the rock, but all clinging to the different levels of the cliff. This model is a partial reconstruction of the town at the end of the Middle Ages. 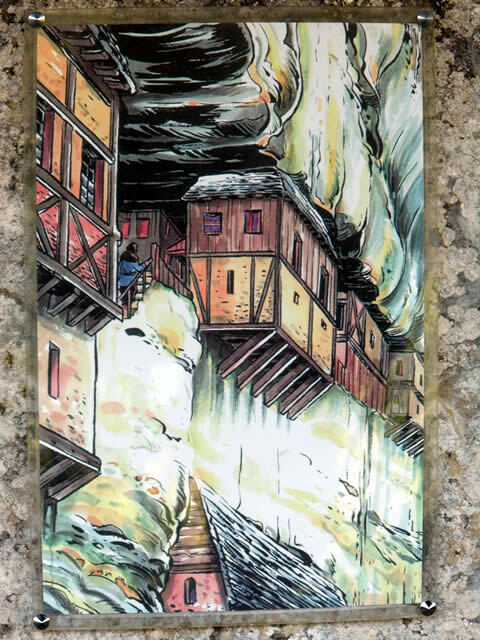 Along the way are pictures on the cliff face to give you more of a sense of what it used to be like. The Catholic holiday of Candlemas takes place in France on 2nd February and is called La Chandeleur. A feast day to commemorate the purification of the Virgin Mary and the presentation of baby Jesus. 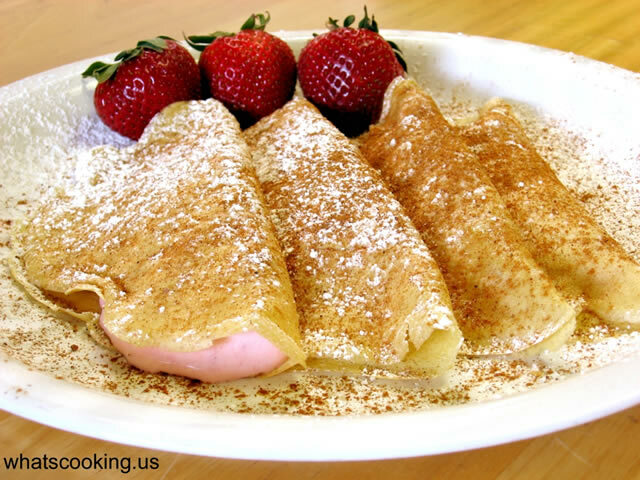 It is also known as le jour des crepes (Pancake Day) and marked by a whole day of crepes. The French follow a tradition of tossing crepes while holding a coin in their writing hand. If the crepes are successfully caught in the pan it will ensure prosperity for the whole family for the rest of the year.